Rene has appeared as a guest soloist and in chamber music concerts throughout the United States, Cuba and Europe. He has shared the stage with prestigious guitarists including Eliot Fist, Benjamin Verdery and Jorge Morel, as well as renowned flutist Ransom Wilson, soprano Lucy Shelton, David Jolley and Paquito d’Rivera. Renowned composers such as Jorge Morel and Carlos R. Rivera have dedicated works to him. Mr. Izquierdo is a recipient of numerous awards. 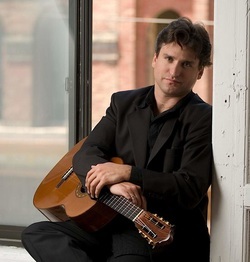 He is a winner of JoAnn Falletta International Guitar Competition in 2004, Extremadura International Guitar Competition, Schadt String competition, Stotsenberg International Guitar Competition among others.